CJ and Edison are at it again! They are trying to climb a wall to get to a priceless gem worth 100,000,000 coins, but there’s a catch. They will need your little one’s help to identify all the nouns. When English worksheets become fun and ‘adventurous’, learning becomes less of a chore. 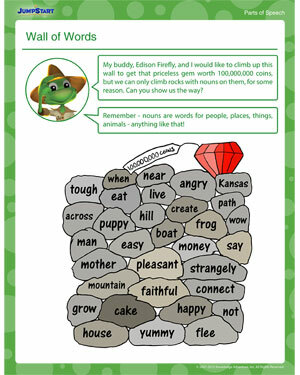 Print out this free kids’ worksheet and give your little ones practice with the parts of speech, particularly nouns. Get started immediately! ‘Wall of Words’ was submitted by Talia DeGisi, a JumpStart fan! Find out more about how you can submit a worksheet of your own and see your contribution on JumpStart.com!